Luxury Car Tuning Compmany Hamman presents a new rim, the Unique Forged Anodized! Yes, that's really the name of it! The alloy wheel is available in 11.0 and 12.0 x 23 size for SUVs from BMW and in 9.0 and 12.5 x 21 for some Ferrari cars. mation about their range for theses cars at the features below here! On the Geneva Auto Salon 2010, Hamann Motorsport present a further example of their Tycoon series. The BMX X6 Tycoon M Evo. Its exterior features showy add-on parts with huge air apertures, wings and dozens of LEDs. Fender extensions widens the car by 60 mm. Also it features their latest wheel creation in 23 inch size. Please see the feature above for details. A lowering kit reduces height by round 40mm. Besides looks, Hamann also takes care of the X6 M's sound by a sports exhaust system which ends at the center of the rear. Together with metal catalysts and a reprogrammed engine control, this component enables more power. The tuners report 670 hp, 780 Nm and 300kph as maximum rates. 0-100kph time is shortened to 4.2 that way. Despite of the performance extras, Hamann doesn't mention any measures to shorten braking distance - they obviously trust in the braking power of the standard M system. Concerning the interior, the stores of the South German company are also full of parts and materials. Amongst the options: A three-spoke sports steering wheel, 12-part decoration set made of carbon and even a flor mat for the trunk with Hamann logo is there. 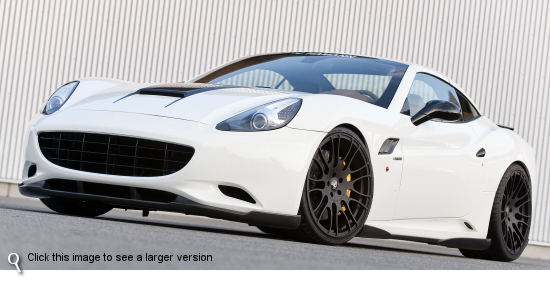 For the all-new Ferrari California the tuners have got a wide range of refinements. Aerodynamics can be improved by a body kit which includes three-part rear diffusor and back spoiler, besides others. Engine power can be enhanced as well. The German specialist are currently preparing an exhaust system which is claimed to rise power by around 20 percent, together with an adjusted engine management. In addition to the brand new Unique Forged Anodized alloy there are other designs. For example the Race Edition multi-piece wheel [see rear-side view images above] with polished rim flanges and titanium bolts in 9 and 12.5 x 21 Inch. And, the workshops of the house offer their very best to make customers individual ideas regarding the interior come true.